Play-Fi Surround is a very convenient way to enjoy a true 5.1 audio/video experience, and we've built it (with our product partners) to be a robust platform through which you can enjoy endless hours of content without audio stutters or drop-outs. With that in mind, there are external elements that can degrade the experience through what is known as wireless interference. When Play-Fi Surround is configured, it establishes a direct wireless link between your Play-Fi Surround Master, and one or two other Play-Fi products. This wireless link uses the same connection method the sound bar uses to join your home network, whether that's 2.4 GHz Wi-Fi or 5 GHz Wi-Fi. Essentially, it cuts out the router from the equation to ensure swift and reliable delivery of surround audio, and because the products will be in the same room, it means the signal quality will provide the best data speed and throughput. What does all this mean? It means the only thing that will dampen the experience is wireless interference. Currently most wireless interference happens over the 2.4 GHz Wi-Fi band. You can learn more about all the things that may interfere with your wireless signal here. So if you want to improve your Play-Fi Surround experience, you should connect the Play-Fi Surround Master to 5 GHz or wire it via Ethernet. Most routers today are dual band, and it's likely yours is too. Some routers are configured to have a different name for the 5 GHz band. This will look like you have two networks when you're looking at the available Wi-Fi broadcasts on your phone or computer. For example, if your network name is "Home", you may see another network named "Home-5", "Home-5G", or something similar. Even though these networks have different names, they actually route everything together, so really it's all just one network. Sometimes the 5 GHz band will have the same name as the 2.4 GHz band. In this case, Play-Fi products will automatically try to connect over 5 GHz if it exists, and if the connection is preferable to 2.4 GHz. You can see how the Play-Fi product is connected in the About screen of the app. The difference between 2.4 GHz and 5 GHz? 5 GHz is generally faster and has less interference, though it has shorter range. But range doesn't matter in the Play-Fi Surround environment, since all the products are in the same room, so it's pretty much always better to configure over 5 GHz to get rid of interference that can ruin the experience. In some cases it can improve the general Play-Fi multi-room experience as well, but consider your overall environment. Sometimes more range is better. You can read more about the difference between the two bands here. If you don't have a dual-band router, and don't want to or can't obtain one at this time (we highly recommend getting one as they are better for Wi-Fi in general), then you can wire your Play-Fi sound bar to the router using Ethernet. If the sound bar does not have an Ethernet port, you can get a USB-Ethernet adapter for it, like the one here. 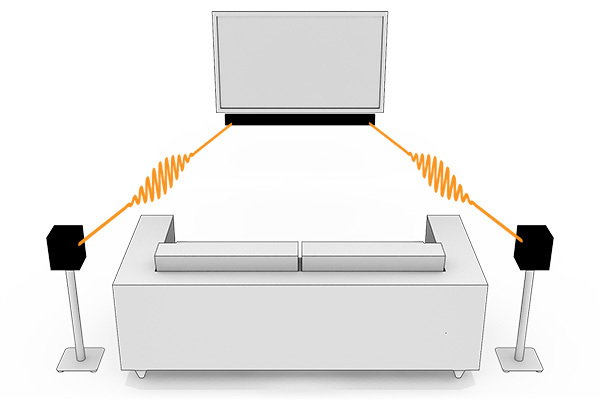 Once the sound bar is wired, it will automatically create a 5 GHz link on its own with the surround left and right products during surround setup, since, as we know now, it will almost always be the better choice at this point in time.